Finder's chronotermostats are the perfect solution for those who wish to keep the temperature – and energy consumption under control. 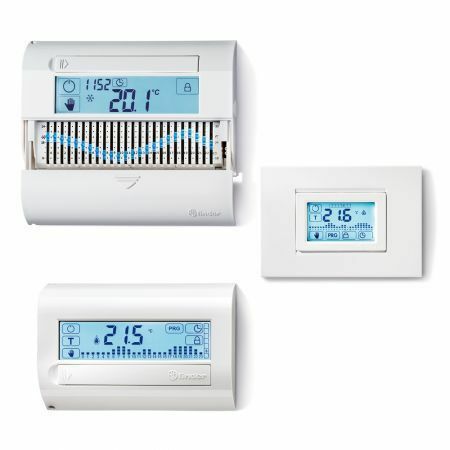 Adjusting and programming the temperature at any time by simply touching a button? Easy with Finder's 1C.61. In fact, this chronothermostat allows you to adjust the temperature simply by acting on the sliders in relation to the hours of the day. Once the adjustment has been made, the protective cover closes to ensure a discreet and elegant look in any environment. The Finder 1C.71 is an ultra-thin weekly chronothermostat designed for wall mounting, featuring a minimal design, available in black and white color. Thanks to the large multifunction touch screen, it can be programmed quickly and easily. The 1C.81 wall-mounted touch screen chronothermostat is the most comprehensive and advanced model of the Finder range. It can be programmed via the APP Finder CLIMA, thanks to NFC technology (available only for Android smartphones), and it allows you to set up programs quickly. Thanks to a special algorithm, the 1C.81 constantly modifies the heating / cooling switch on / off to optimize fuel consumption, always guaranteeing the desired temperature. Available in white or gray anthracite color.